​"Simply a great thriller--full of action but about people, tough but not bleak, fast and yet thoughtful. Highly recommended." "SAILOR is a modern-day fable, compelling and heartbreaking. It will grab you from page one and keep you a grateful hostage until its surprising and moving conclusion." "SAILOR is a great read! Just as you think you know where you're going, Tom Epperson throws another twist in your path. Style and story, I loved it all." "Employing spare, almost hallucinatory prose, and a keen eye for detail, Tom Epperson has created an unforgettable cast of characters set against a sun-bleached noir background. By turns frightening and darkly comic, SAILOR is the literary equivalent of a Coen brothers film." "In this exquisitely written, expertly plotted thriller, a desperate woman and her young son, on the run from her vengeful father-in-law (she’s responsible for her husband being incarcerated), puts her trust and her last chance for survival in the hands of Gray, a man with a shadowy past. In places, the novel reads like a modernday noir; in others, it feels like a Tarantino movie—not surprising, perhaps, from an author whose 2009 debut novel The Kind One was Edgar-nominated and who makes movies with Billy Bob Thornton. If this one doesn’t also get an award nomination or two, it’ll be a big surprise—and a gross injustice." "A high-energy read with a veritable smorgasbord of bad guys: a crooked U.S. marshal, a Russian hit man, a sweet kidnapper, and a Chinese power broker who reads the English classics. ...A solid, engaging thriller with fully fleshed-out characters. Recommended for fans of gritty suspense novels who like their villains vulgar and their heroes noble." "Like The Kind One, which was one of the most enjoyable novels in recent memory, Sailor is a breezy, smart tour through familiar low-life tropes and hard boiled characters that has the lingering afterglow of literary fiction. (The closest parallel may be Elmore Leonard. Epperson is every bit that good, if not that prolific.)... With black humor and grim assurance, Epperson pushes his twisting tale beyond the conventions of the genre, delivering a humane and strangely moral tale where every action engenders consequences which even the worst thugs must consider... [Epperson] wields his spare prose like a razor - you don't even feel it as he cuts out your heart." 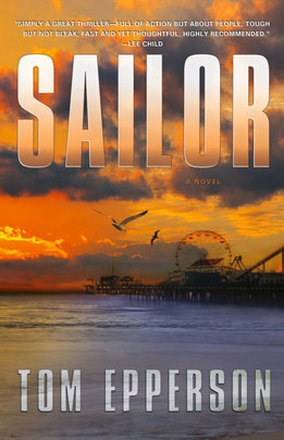 In the world of Tom Epperson's violent, subtle and often beautiful thriller "Sailor"(Forge, 352 pages, $24.99), kindness coexists with cruelty: A hit man yearns to protect the youngster he has been hired to abduct; a Mafioso dispenses death with one hand and familial love with the other. This book is as au courant as any crime-fiction novel or neo-noir flick, but its themes (courage, morality, loyalty, grace under pressure) are as old as Hemingway or Lao-tzu. It seems fitting that the reluctant hero of "Sailor" is a Southern California drifter named Gray. If I were a damsel in distress fleeing a past and people who wanted me dead, like Gina Cicala in the modern noir thriller "Sailor" by Tom Epperson, I'd want to meet a guy like Gray too. And if I were Gray, a mysterious stranger with a tortured past, the kind of guy who rescues dogs from their abusive owners, meeting an on-the-lam beautiful woman with a preternaturally bright son would just make perfect sense. Tom Epperson first came to the idea that eventually became his new book “Sailor” in the early ‘90s, though he thought of it first as a screenplay for Hollywood, a world in which he’d recently found a measure of success as the co-writer of the movie “One False Move” with his boyhood friend Billy Bob Thornton. Billy Bob Thornton...attends Tom Epperson book-signing @ Book Soup! "Sailor" flies off shelves! For fans of Tom Epperson, the cozy little shop on Sunset just shy of Larrabee Street (where intriguing maze-like aisles lined with rickety shelves stacked full of books beckon from bottom-to-top) was the hottest ticket in town on Tuesday night. Blackstone Audio is pleased to present this exclusive interview with Tom Epperson, acclaimed screenwriter and award-winning author of Sailor. Conducting the interview is award-winning narrator and Blackstone’s studio director Grover Gardner. Tom Epperson is the perfect example of everything great about “Show Business” because he is a success that took a decade plus of hard work, many failures, and never ever giving up to happen!! Tom, along with his childhood best friend, Billy Bob Thornton (Yep..that Billy Bob Thornton! ), came to LA (You have to listen to the interview below to understand the hilariousness and greatness of their journey that I think should be turned into a book/movie on it’s own! ), and after years and years of “Trying to get their big break”, Tom has become one of the fastest rising stars in the Literary community and Screenwriting world.